Seeking To Cut Down On Corrections With A 'CQ' : NPR Public Editor As errors pile up, the newsroom looks to implement new procedures. NPR's Training Team and Standards and Practices Editor Mark Memmott offer an accuracy checklist for reporters and editors to use as a tool. Can NPR reduce the number of monthly mistakes it makes in half, by October? That's the newsroom's ambitious goal. On Monday, referencing an error rate that he called "unacceptable," NPR's standards and practices editor Mark Memmott laid out a new newsroom system that he hopes will lead to fewer corrections. In his memo to the newsroom, Memmott wrote: "We've posted about 100 corrections a month this year. There is no acceptable number of mistakes per month, but there certainly is an unacceptable number. One hundred a month is unacceptable." 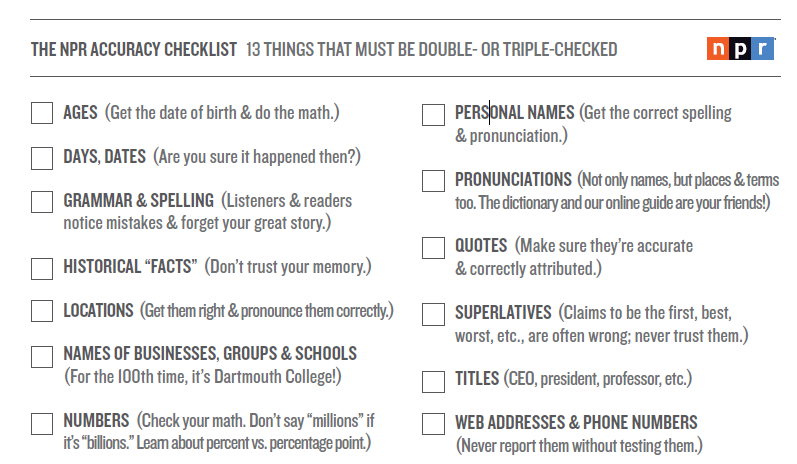 Every name, date, place, number, title — all 13 things on the NPR Accuracy Checklist — must be double- or triple-checked by the writer before the copy goes to an editor or is posted. By copy, we mean scripts, Web stories, DACS lines, Facebook posts, captions, headlines — anything that's going to be seen or heard by our audience. The act of doing that checking is CQ'ing. When something is CQ'd, 'the case is closed.' You're telling the editor that 'I know this is correct because I've checked more than once against impeccable sources.'" I've written before about errors, from a recent erroneous description of Easter to the "stealth corrections" slid in by the newsroom when a radio piece or interview is rebroadcast (the error is simply cut out, often without acknowledgment in the online transcript). My office heard from many people about a particularly unfortunate recent interview where the interviewee — Michigan State University's interim President John Engler — was called by the wrong first name (twice) and was identified as from both MSU and the University of Michigan (a particular sensitivity in that state). Is 100 errors a month too many for a newsroom with the output of NPR's? It's certainly a lot of errors, but I don't know what an appropriate number would be. Newsrooms do make mistakes and what's most important is a policy to correct them quickly and transparently (Morning Edition acted appropriately: it fixed the errors for subsequent airings of that interview and, in addition, came back the next day with an on-air correction that also gave it the opportunity to clarify something Engler had said.) But any error is almost certain to be noticed by listeners and readers, who are quick to point them out. Mistakes undermine trust and credibility in a news outlet — and partisan forces are quick to invoke them these days as part of a coordinated political strategy of attacking the news media. For its own credibility, and to serve its audience, NPR can't afford to be making this many errors. He said the errors have many causes. Some get made early in the reporting and writing process but should also have been caught by editors (as was the case with the Engler interview). Some of the errors are due to the radio-to-digital system; a name misspelling in a radio script does not matter until that error gets passed on to the story's digital version. "Radio writers didn't have to worry about that for years," Memmott said. In his newsroom note, he emphasized "we're doing more good work — but without more good people. Almost everyone is stretched." He told me that editors in the newsroom have said they are just being asked to do too much. But, he told me, as NPR does more podcasts, and puts out more digital and social media content, the newsroom is "just not slowing down to give things that one more check before we send it on." In his note to the newsroom, he said time should not be used as an excuse. "If the facts are right from the start, the checking is going to go quickly and will open up more time to sharpen stories. What's more, rigorous CQ'ing at the front end will cut down on the amount of time spent fixing mistakes and writing corrections. Double-checking the spelling of a name usually takes less than a minute. Fixing a story, writing a correction, explaining to a supervisor why you made the mistake and — if you're a repeat offender — being called in for a conversation that ends with a note in your personnel file take much longer." In addition to prodding everyone to be more careful, what else can NPR do to reduce the number of errors? The newsroom, he said, has had recent discussions about not being so quick to post digital stories and "maybe some things on the radio," as well. That, of course, competes with the notion that the newsroom wants to be timely, in an increasingly unrelenting news cycle. He said the newsroom also has considered moving up deadlines for enterprise reporting, such as investigations and in-depth stories, building in more time for fact-checking. In Memmott's estimation, NPR could also use "at least three" more copy editors, doubling the current number. Notably, NPR is without a copy editor at all on Sundays, even though it has become an increasingly busy news day in this era. Newsroom leaders are trying to emphasize that limiting errors is now an expectation. In the past, he said, repeat offenders have been talked to and notes put in their personnel files. Now, he said, "We're not going to go to the three-strikes-and-you're-out" policy, but errors will be taken into account when evaluating job performance. We looked at the types of errors being made. Of 56 corrections posted in June (through Wednesday), 15 were misspellings, mostly of names. Those are not serious errors, but they are also very easy errors to avoid. Thirty were wrong identifications of names, places or dates; for example, the misidentification of the Pew Research Center as the Pew Foundation, a mix-up of Washington, D.C.'s National Mall and National Cathedral, and a high-profile shooting at a baseball practice that was said to have taken place in January 2017 when it really took place in June. But there were also errors involving more substantive issues, including Tuesday's statement on Morning Edition that "carbon dioxide levels in the Earth's atmosphere are rising because of climate change." As the correction noted, "In fact, they are rising because of human activity." And the error in the story about loss of ice in Antarctica that ran on June 13: "An earlier version of this story incorrectly said that 0.6mm was nearly a quarter of an inch. It's about 2 percent of an inch." And the obituary of actor Jerry Maren from June 7, with a headline and Web introduction stating that he was the last living actor to portray a munchkin. As the correction wryly said, "It is not known for sure whether that is the case." Memmott told me the target is to reduce the error rate by half by October. Can the newsroom rise to the challenge set before it? We'll check back then. In humbling fashion, we've updated this post to clarify that the 2017 shooting took place at a baseball practice, not a game.